Paige Rohrick of PaigeeDraw has been announcing winners daily! There are lots of winners still to come! PaigeeDraw World is a contest that allows aspiring Manga Artists to have their drawings seen by potentially millions of people, while simultaneously helping the world learn to draw Manga! The PaigeeDraw World Project is trying to put together the best drawing application and web site in the world for learning to draw manga! To enter the PaigeeDraw World contest, you must create a drawing tutorial of a Manga Character, a Chibi, a hand, face, eye, etc.. Your tutorial could be featured on the PaigeeDraw Web Tutorials Page, or on a future PaigeeDraw Application! 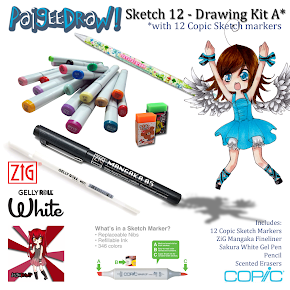 Prizes - you could win a complete PaigeeDraw Drawing Kit for your Character or Chibi Drawing! 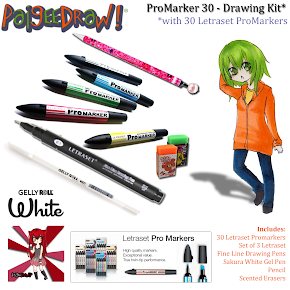 You could also win 3 to 6 markers for your tutorial! Click HERE to see her Character tutorial! PaigeeDraw World Tutorial by Renee Guan! Description: PaigeeDraw's Mai by Renee Guan! 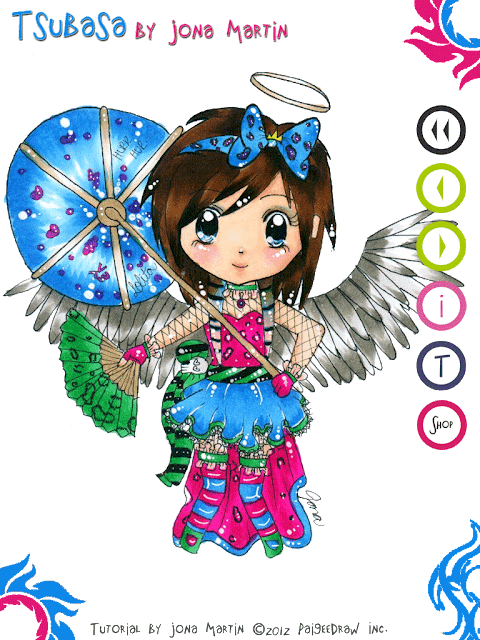 Check out all of the PaigeeDraw World Tutorials on ChibiDraw! 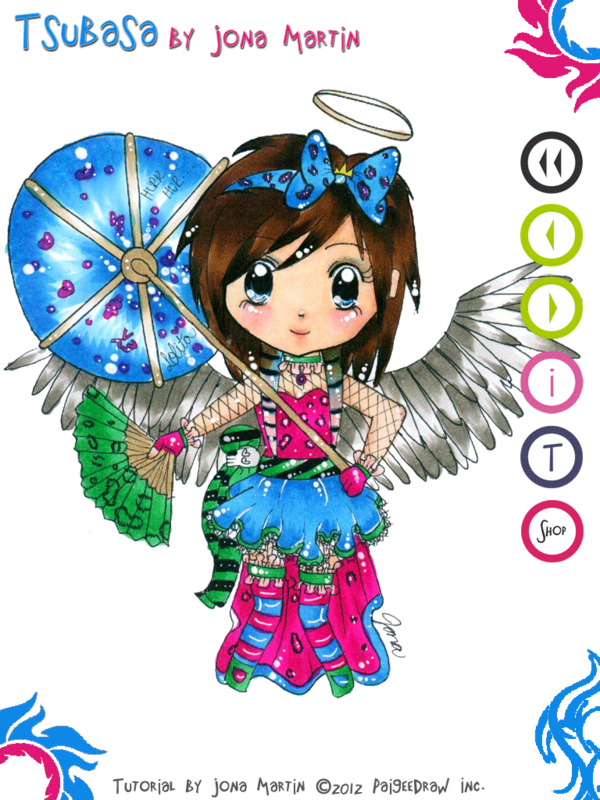 ChibiDraw is pleased to announce the launch of its new website! 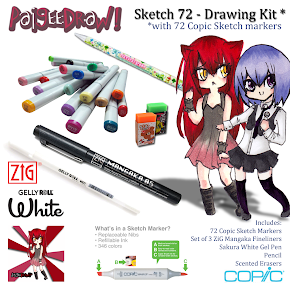 Check out the new ChibiDraw site for Free Manga Drawing Tutorials! New drawing tutorials are being added daily! We want to have the best site on the internet for people who are learning to draw manga! Paige Rohrick of PaigeeDraw has been announcing winners daily! This is the 4th winner today! There are lots of winners still to come! Description: Tsubasa by April Giglione! Paige Rohrick of PaigeeDraw has been announcing winners daily! This is the third winner today! There are lots of winners still to come! Paige Rohrick of PaigeeDraw has been announcing winners daily! This is the second winner today! There are lots of winners still to come! PaigeeDraw World Tutorial - Mail by Daria Glushkova! Paige Rohrick of PaigeeDraw is announcing another PaigeeDraw World Winner! There are still LOTS of prizes to be won! PaigeeDraw World is a contest that allows aspiring Manga Artists to have their drawings seen by potentially millions of people, while simultaneously helping the world learn to draw Manga! To enter the contest, you must create a drawing tutorial of a Manga Character, a Chibi, a hand, face, eye, etc.. Your tutorial could be featured on the PaigeeDraw Web Tutorials Page, or on a future PaigeeDraw Application! Winner: 12 year old Alice On! PaigeeDraw World Tutorial - Haru by Alice On! PaigeeDraw World Tutorial - Aoi by Brittney Jimenez! Click HERE to see her Chibi tutorial! PaigeeDraw World Chibi Tutorial by Suoney Phaengduang! - Winner! Over the the last year, ChibiDraw has become the #1 application on iTunes for people learning to draw Chibis! ChibiDraw is also a facebook community where people draw and share their chibis with almost 100,000 other people from around the World! To Celebrate ChibiDraw's 1st Birthday, Paige Rohrick of PaigeeDraw / ChibiDraw decided to have the ChibiDraw "Birthday" Mini Contest! Over 75 people from around the world entered the contest that only lasted about a week! As with all the PaigeeDraw / ChibiDraw Contests, it is extremely hard to decide the winners. There are soo many amazing drawings entered! ChibiDraw Birthday Contest Winning entry by Ryu Darl! Title of Drawing: Wish you guys have a happy birthday! 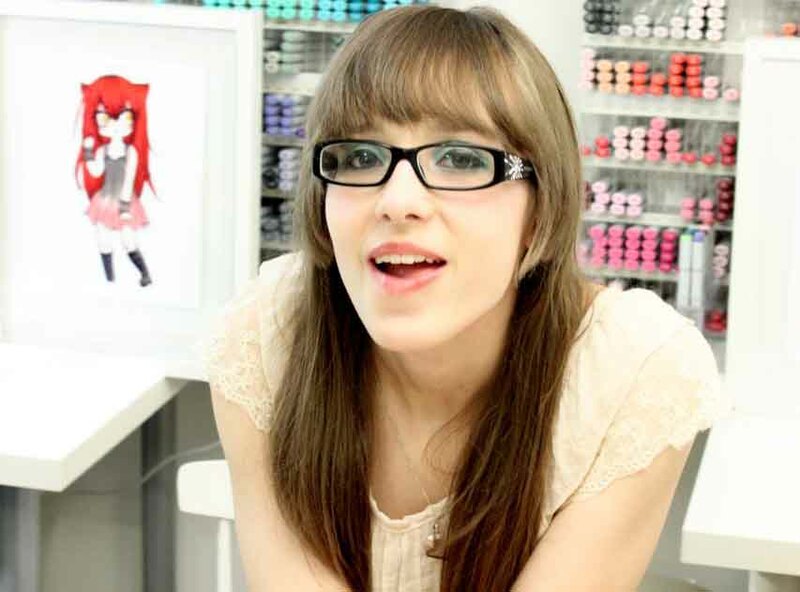 Another Winner - PaigeeDraw World Manga Character Tutorial! Paige Rohrick of PaigeeDraw is announcing another PaigeeDraw World Winner! There are still LOTS of prizes to be won! This is an amazing Manga character tutorial! To enter the contest, you must create a drawing tutorial of a Manga Character, a Chibi, a hand, face, eye, etc.. Your tutorial could be featured on the PaigeeDraw Web Tutorials Page, ChibiDraw Home Page or on a future PaigeeDraw Application! PaigeeDraw World Winner: Luna Blacktsuki! Click HERE to see her tutorial! Description: Nyan by Constanza PaolaOlmedo García "LunaBlacktsuki"
Congratulations Luna! What an amazing tutorial!!! Description: Aoi by Trang Duong! 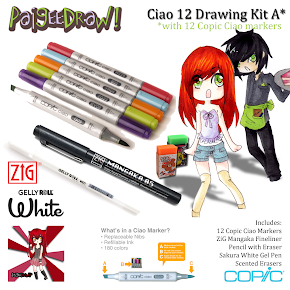 Prizes - you could win a complete PaigeeDraw Drawing Kit for your Character or Chibi Drawing! You could win 3 to 6 markers for your tutorial! PaigeeDraw World Tutorial by Sofia Tokumura! ChibiDraw is almost 1 year old! To Celebrate we are having the ChibiDraw "Birthday" Contest! This is a mini contest - so dont wait, get your entry in early! You can also enter the PRO contest with an Order Number from the PaigeeDraw Online Store! Simply submit your Order Number with your contest entry. The theme of our new contest is "ChibiDraw's 1st Birthday". Use your imagination! One character must be wearing a "PaigeeDraw" shirt. a birthday cake or a present (It's a birthday). At least 2 of the following ChibiDraw / PaigeeDraw characters must be included: Nyan, Aoi, Mai, Haru, or Paigee. You may use one or more of your own original characters. Only Chibis can be used. All drawings must be done traditionally! 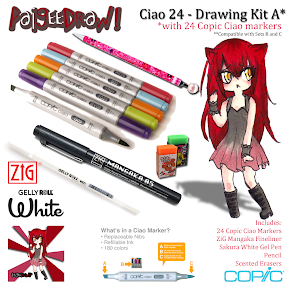 ChibiDraw is about working with traditional media and we would like to do the same for the contest. A hand drawn PaigeeDraw, ChibiDraw, PaigeeDraw Christmas or PaigeeDraw Boys Logo must be included on every drawing submitted. You can use the existing PaigeeDraw, ChibiDraw, PaigeeDraw Christmas or PaigeeDraw Boys Logo, or create your own. If the logo is not included, your drawing will NOT be included in the contest. A maximum of 3 images can be submitted. All drawings must be colored. Background is optional but encouraged. Black and White drawings will NOT be accepted in this contest. As PaigeeDraw is a site for all ages, age appropriate drawings must be submitted. We reserve the right to refuse drawings that may not be suitable for all ages. Friends and family of Paige Rohrick are excluded from the contest. Must not use other individuals copyrighted works. Must not copy / outline other individuals characters or original works. Must not be an entry used in a previous contest. Only 1 prize can be won per individual. Elements: The elements must be included on each drawing submitted. You can also enter the contest with an Order Number from the PaigeeDraw Online Store! Simply submit your Order Number with your contest entry. Send your drawing by email to fanpage@paigeedraw.com . If your drawing is selected as a "Winner" and you have included your PaigeeDraw Contest Code or Order Number with your entry - you are automatically registered for the +Bonus prize. *Minor color substitutions may be made to contest prizes dependant upon color availability at contest close. **All submitted drawings may be featured on any of the PaigeeDraw Sites, including the PaigeeDraw, ChibiDraw and PaigeeDraw Boys facebook page - all entry details will be included with the drawing. All submitted drawings may be featured on the PaigeeDraw Web Site, PaigeeDraw Blog, PaigeeDraw Online Store, or the any of the PaigeeDraw Applications including PaigeeDraw, ChibiDraw, PaigeeDraw Christmas and PaigeeDraw Boys. Get started drawing! Looking forward to everyone's Birthday Entries! A huge thanks to the PaigeeDraw Community for all of the continued support! Paige Rohrick of PaigeeDraw would like to announce the 1st place winner of the PaigeeDraw Best Friends Contest! 1st Place Winner of the PaigeeDraw Best Friends Contest! Alexia Onate Rivas - PaigeeDraw Best Friends 2012 1st Place Winner! Story: Yuenne and Zuzu wanted to take a best-friend photo. Kuya says he can take the photo with his cellphone, but they both tell him "take the pictures with us instead!" 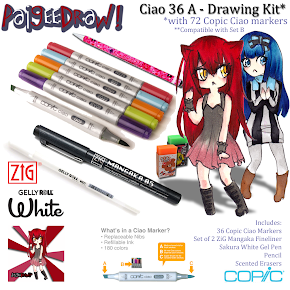 Copic Ciao 27 Piece Set! PaigeeDraw Best Friends Contest - 2nd Place Winner! Paige Rohrick of PaigeeDraw would like to announce the 2nd place winner of the PaigeeDraw Best Friends Contest! 2nd Place Winner of the PaigeeDraw Best Friends Contest! "Please be ready for the major exams three days from now." It was the last statement of the last subject teacher as she dismisses the class for today. As Nyan and Aoi walk down the empty corridor of the second floor, Nyan declares a problem. "Aoi, I don't understand most of the lessons we had for this semester." The two stop walking and give each other an empty stare. "..." Aoi looks at Nyan straightly. "Well?.. Eh? You're not surprised?" asks Nyan. Aoi replies, "That's A LOT of lessons you don't understand then." while scratching the back of her head. "Sorry! I'm really just having a hard time concentrating on the lessons. I mostly mix up lessons of other subjects with other subjects." exclaimed Nyan. "I-It's okay, Nyan! No need to apologize! We'll think of someone who'll be able to help us study.." says Aoi as she pats Nyan's back to relieve her tension. Suddenly, Nyan's ears start to fling up in the air with great excitement and had surprised Aoi with a yell that echoed through the hallway. "A GROUP STUDY!" She then grabbed Aoi's hand and started dragging her all the way up to the 4th floor, then arriving at a classroom of a junior named Kuya who is also close friends with both girls. "Kuya! Come join our group study for the major exams!" said Nyan. "That's a bit sudden but sure. I'll "help" you study." shrugged Kuya. "I don't have any part-time jobs during this moment since I also have to prepare for the exams. So, where's this group study going to be held at?" "Tomorrow Saturday at 10 in the morning! At.. Uh... Hmmm..." Nyan sinks into deep thought of the problem at what venue the group study will be held. A long pause of silence have passed and suddenly Aoi raises her hand. "Um! My house is spacious.. Maybe we could study at my place?" "AH GOSH! REALLY?!! THANK YOU AOI!~" Nyan says as she embraces Aoi for the offer. "No problem~." "Okay so, we'll see each other tomorrow at 10 in the morning at Aoi's place~ See you guys~." The three then waved each other goodbye as they head home. The next day, all the three students were gathered at Aoi's place with complete study references. They taught each other what lessons from subjects they missed and haven't understood. It was a pretty radical group study. Although some hours later, the study session was getting awkward as Aoi starts to fall asleep and Nyan was doodling cute stuff beside her notes and started using her mobile phone. "Oi, Nyan, are you still listening to me? The equation for this--." says Kuya as he does his best to get Nyan's attention to get her to study. "Yeah.. Hold on--.." She then pulls out her digital camera. "Everybody say CHEESE!" The sudden exclamation done by Nyan made Aoi wake up and pose a little for the camera still half-asleep, holding her favorite pen loosely in her right hand. "Hey.. Keep your mobile phone and your camera from this. Get serious, Nyan! This isn't the time to be cute in photos!" scolds Kuya. "I know, I know. Hahahaha! You look so grumpy in the shot!" laughs Nyan. "Oh come on.. The exams are 2 days away!" Kuya reminded both the inattentive girls. Nyan then smiles while replying, "We know that. I just want to take a souvenir as a reminder that we make the best trio of best friends who held the most interesting group study I've been to!"